An Honorary Senior Lecturer at the University’s Institute of Ageing and Chronic Disease, Adnan Saithna, has received an international orthopaedic award for his sports injury research. 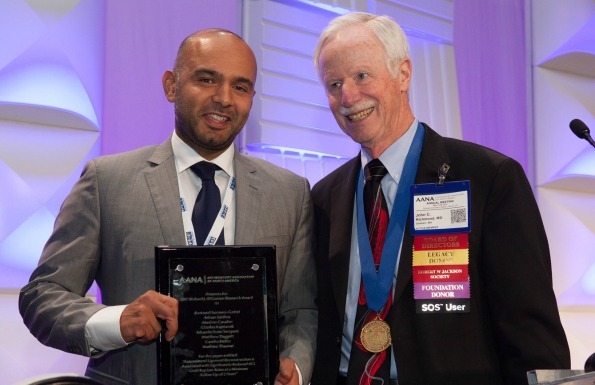 Adnan Saithna, who is also a Consultant Orthopaedic Surgeon, received the Richard J O’Connor Award from the Arthroscopy Association of North America (AANA) at the Annual Meeting in Denver, USA, on behalf of the Scientific ACL NeTwork International Study Group (SANTI). AANA is an international professional society of more than 4,000 orthopaedic surgeons and other medical professionals who are committed to advancing the field of minimally-invasive orthopaedic surgery to improve patient outcomes. The award was given for research conducted through Adnan’s collaboration with Dr Bertrand Sonnery-Cottet (the senior author), based at the Fédération Internationale de Football Association (FIFA) Centre for Medical Excellence, France. The research relates to anterior cruciate ligament (ACL) rupture, a common sports injury that results in giving-way and instability of the knee that often requires surgery. It is well recognised that young athletes participating in pivoting sports (e.g. football) have high rates of graft rupture (failure of the new ACL reconstructed at surgery) and low rates of return to pre-injury levels of sport. Adnan Saithna, said: “The research shows that our surgical technique for dealing with ACL rupture – which involves reconstructing both the ACL and anterolateral ligament results in significantly reduced ACL graft rupture rates and improved likelihood that patients can return to pre-injury levels of sport when compared to the other most common types of ACL reconstruction techniques used in contemporary practice. A previous winner of the award has been Dr Richard Steadman, one of the most famous knee surgeons in the world. The full study, entitled ‘Anterolateral Ligament Reconstruction Is Associated With Significantly Reduced ACL Graft Rupture Rates at a Minimum Follow-up of 2 Years: A Prospective Comparative Study of 502 Patients From the SANTI Study Group’, can be found here.